Being in New York City — or, more specifically, Manhattan. Always a surge of positive energy. A sense of exhilaration A lifting of the sprits. It’s hard to be depressed. How does one account for it? I would say that it’s the following. The concentration of people. It’s why I love cities. The concentration of business establishments; of restaurants serving every cuisine imaginable, at a wide range of prices; of coffeehouses everywhere where you can sit musing or chatting for what seems like forever; of places of interest such as libraries, theaters, cinemas, concert halls, museums. The parks and public gathering spots, such as public sitting areas everywhere on even the most congested avenues. The wide sidewalks, thronged with people. The wonderful infusion of people of all races and nationalities. The immigrants. The tourists. What they contribute and share in terms of enthusiasm and amiability. The incredible variety of languages spoken. Heard all the time, on the street and on the subway. Music to the ears. The access to water, to the ocean and the Hudson and East Rivers, every which way one turns. A sense of being impervious to weather. It’s fun to walk the streets on a hot summer day when everyone is without a coat. On a winter’s day when somehow an icy chill doesn’t seem to matter. When it makes your blood tingle, and when walking the streets makes you feel warmer. 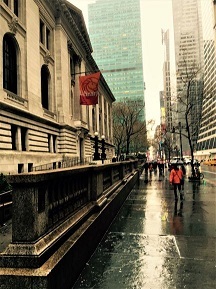 And when it’s raining, the rain-slicked sidewalks often have a feeling of romantic beauty. The City. Manhattan. The energy! The fun. The sheer excitement! Your observations on Manhattan are spot on. Your phrasing creates a dynamic rhythm structure, complementing the pulse of the City. This entry was posted in my city and neighborhood, photographic and tagged Roger Smith, Roger W. Smith on January 29, 2019 by Roger W. Smith.